These days when I take a shower, I enter into a world of my own. Some time I just stand under the shower in deep thoughts. At such time, I feel like a philosopher. I would fold my hands and stand under the shower to add meaning to the philosophical look. My mind would be blank at such times. But the posture is something that is worth 1000 pictures. Now don't you dare imagine me in that posture. Sometimes I become a musician in the bathroom. I would sit on the plastic stool and would play some rhythm on the plastic bucket. Depending on the water, pressure, the genre of the music would vary. At times I have become a Vocalist too. The shampoo bottle will become the cordless microphone. I can move around the bathroom and sing songs at will. The bathroom floor becomes my stage. The wall facing me becomes my imaginary audience. Sometimes it is an indoor audience. Some times it is Woodstock. There are times when the house maid leaves the mop stick inside the bathroom. During such days the mop stick becomes a stand microphone and I would be doing a Freddie Mercury act or an Axl Rose act. When the performance level goes high, someone would bang the door and ask me to shut up. Then sometimes I play the ceiling splash game. It is a simple game to play. Stand under the shower and open your mouth so that water is collected inside your mouth. Do not drink the water. Just fill your mouth with water. Now close the shower knob and then blow the water on to the ceiling. You can do modern art on the ceiling or draw some numerical values on the ceiling. If the light bulb is on, do not play this game. There was a time , when I played this game and the light bulb burst. Now I love taking bath like never before. When I was a kid, I hated taking bath. During the summer holidays, I would not take bath for days at a stretch. My mom would force me to take bath. I don't know why children hate taking a bath. It is fun. The first instant when the water touches your body is the thrilling moment. When you take a mug of water and pour on your dry skin, you will experience a gyration. After that things will become normal. This gyrating feeling was what that makes kids to hate taking bath. If taking a shower was this much fun, then taking a bubble bath inside a tub is funner and some times funnest. Grammar nazis will be now angry with me for using the words funner and funnest; but I care a damn. I just had my bath now. Go have your bath- you dirty people. Moral of the story : Stay Clean. 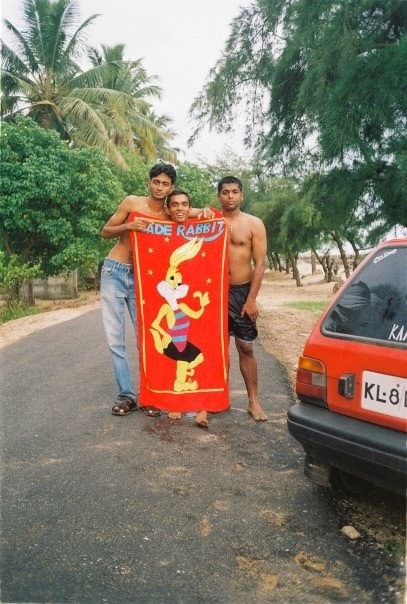 Picture : Jithin and Andy are magicians who do lot of magic tricks using the red towel.. Yours Truly is behind the red towel. Now, that was the funniest thing I ever read about bathing! :P Indeed bathing is fun. Chris, I believe i was studying 9th standard at that time, i splashed water all over the ceiling when i was taking bath. My true intention was while i have the bath so do the bathroom can take a bath along me. Unknowingly i splashed on the bulb also, at first the bulb gave me warning. But i ignored and splashed again on the bulb, this time the bulb got burst and my mom came running to bathroom. First i was shocked about the bulb burst and then i laughed at the incident. That was the last day i played that game.